The History Blog » Blog Archive » The last XXIV hours of Pompeii on Twitter today! 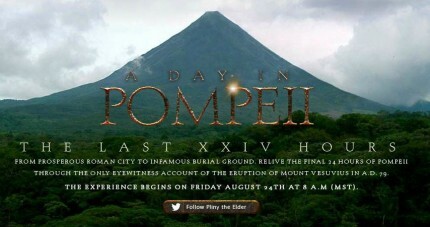 The last XXIV hours of Pompeii on Twitter today! Today is the 1933rd anniversary* of the eruption of Vesuvius that destroyed the cities of Pompeii and Herculaneum. Starting at 8:00 AM MT, Pliny the Elder will tweet the eruption live just as it all went down. I felt this was a fitting occasion for my first tweet, which was actually a retweet. It’s a little strange and offputting, but then again, so are tremors in the earth and a Vulcan’s forge inside a mountain belching smoke. Twitter Pliny is a feature of the Denver Museum of Nature & Science’s A Day in Pompeii exhibit which runs from September 14th, 2012 to January 13th, 2013. They have some neat companion events for children and adults, from a toga party to lectures by volcanologists. *According to traditional dating based on a letter Pliny the Younger, nephew of the elder Pliny who was visiting his uncle on that fateful day, wrote to the historian Tacitus describing the events 25 years later. Archaeological evidence suggests the eruption took place later, sometime in November. A second letter from Pliny to Tacitus puts the date at November 23rd. SPOILER ALERT: Here are Pliny the Younger’s letters to Tacitus. Do not read if you want to be surprised by Twitter Pliny’s live updates. This entry was posted on Friday, August 24th, 2012 at 7:24 AM	and is filed under Ancient, Multimedia, Museums. You can follow any responses to this entry through the RSS 2.0 feed. You can skip to the end and leave a response. Pinging is currently not allowed. I don’t do Twitter but this sounds like a fantastic use of it! I got to A Day In Pompeii in Cincinnati over the summer, and boy is it a neat exhibit. (I got extra credit for my Rhetoric class, too!) I’d heard about the plaster casts but was still surprised how powerful they are to see in person. I highly recommend the exhibition to anyone and everyone. That is some Goscinny and Uderzo-level quipping right there. I saw that. I like the link to the street view map of Pliny’s sea view. That makes up for when you picked the wrong time to stop sniffing glue. The 1900th, actually. The eruption happened in 79 A.D.
You are the reason I got a twitter thing and only after did I think to discover that you never use it. So, now that I don’t really watch the twitter except when I’m bored you go and start tweeting. But Pliny’s missive is on a one of the days of the year bort’s heart is soft, so I can’t even offer a judicious harumph at you. I’ll take it. How did you even know I had a Twitter account? Did I announce it and forget? Pliny the Younger : “As he was leaving the house, he was handed a message from Rectina, wife of Tascius whose house was at the foot of the mountain, so that escape was impossible except by boat. She was terrified by the danger threatening her and implored him to rescue her from her fate”. Why didn’t she just leave with the letter? We can’t know for sure since we don’t have her side of the story. My guess is she didn’t want to leave without her valuables, belongings, extended family and/or staff. The new 3D movie “Pompeii,” is a tremendous testimonial and remembrance of the people who perished in the hand of natures wrath. A reminder of the destructiveness and power of nature unleashed. One I am sure the people of the Philippines know well as they face tornado after tornado and suffer heartbreaking loss.